Isn’t she a beauty? The tree, that is 🙂 I’m sure going to miss this festive decor! All of the trees and twinkling lights make for my favorite pictures. Now that we’re in the home stretch to Christmas, are you guys ready? I’m actually finished with everything, so now I get to enjoy my time making cookies, looking at lights and jamming to my favorite Christmas tunes, before the holiday comes and goes. 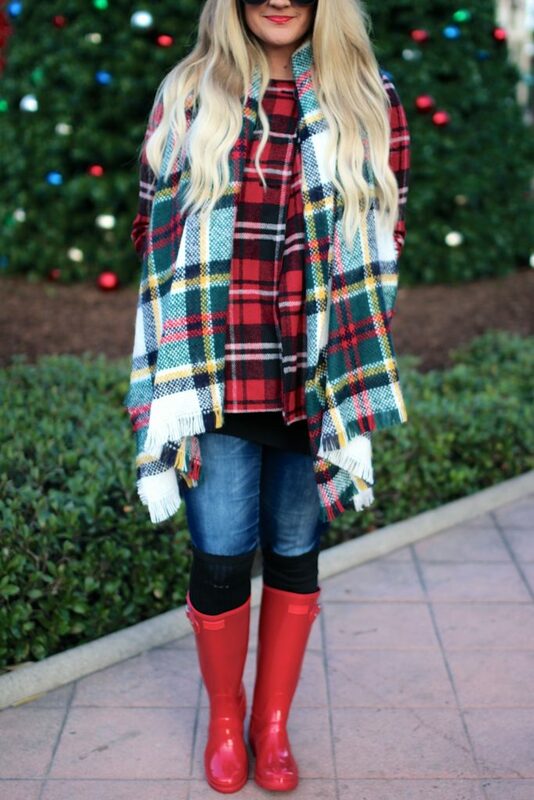 I love the plaid layers in this outfit! I’m also trying to savor the last days before Christmas…why does it always seem to sneak up so fast? Makes me sad! The tree takes only a close second to your plaid pretty goodness!! 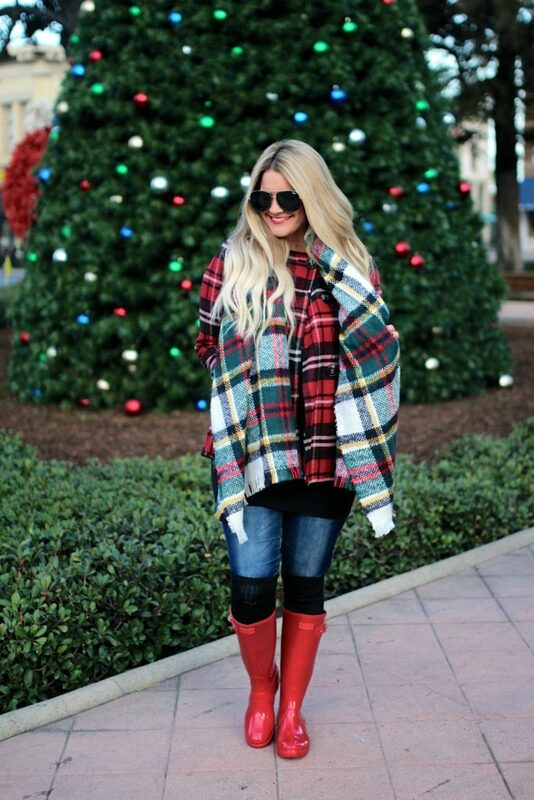 Oh love that plaid with the red..ooh la la, festive, fun, cozy and all things Holiday Happy! Have a fun and festive week my gorgeous friend! So festive and cozy! I have been looking for a scarf like this and have heard Etsy has a great selection. I need to go check it out! I will be so sad when all the Christmas decor is gone, it’s my favorite time of the year too! Glad to hear you all done with your shopping and can enjoy the next week! Hope your party went well this weekend, too! Happy Monday, Shauna! Love this! That scarf is SO cute! Impressive that you’re done with everything!! We’ve got a few last minute things to finish up! Loving all the plaid. That scarf is so beautiful. You are Christmas perfection! I LOVE the combination of the different plaid prints! And that tree is SO PRETTY! Such a pretty xmas look ! LOVE IT ! Such cute photos! 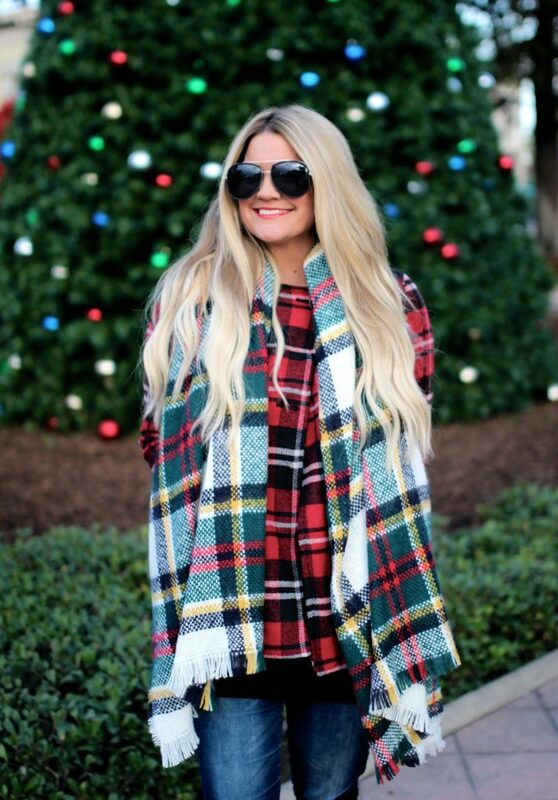 Love the plaid on plaid look! The perfect Christmas post! So festive and fun! Nothing more festive than this outfit! Love the pops of color. Love the way your hair pops off the pretty plaid! I am going to miss all the decorations too! How is Christmas in a week?! That tree is so pretty. I love all these photos. Love the plaid on plaid! So cute! What a beautiful tree! I love the Christmas decor that the Holidays bring! Love the variety of color in this cozy look! 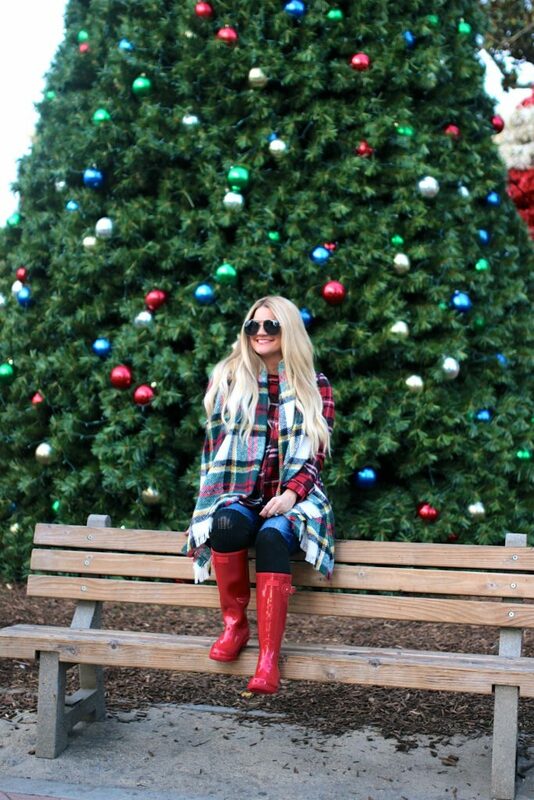 The double plaid paired with the red boots makes for a perfectly cheery winter outfit, and you match the tree beautifully! The tree is beautiful and so are you! Love the outfit, girl. You look so cute and festive! Perfect for the holidays girl! That plaid scarf and plaid shirts makes a really cute combo dear! Every single one of your holiday looks has been perfect! You have knocked them all of the park. 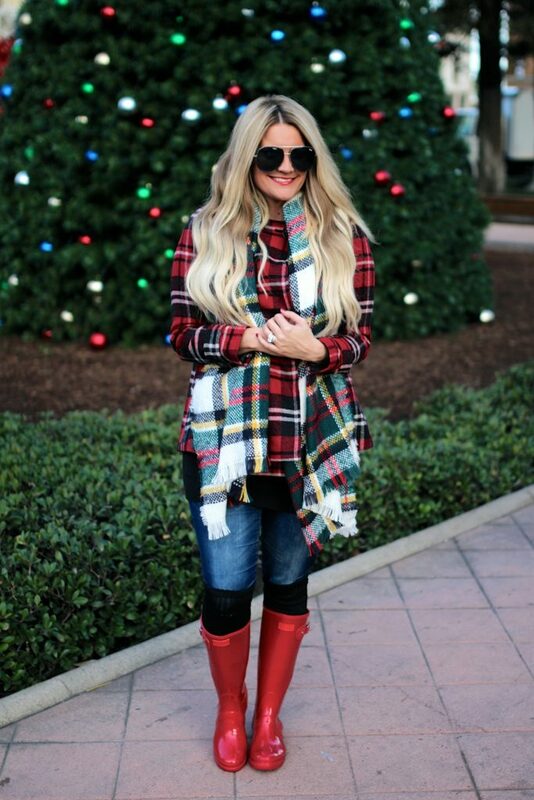 This is stunning, love the mix of plaids. Gorgeous lady! You look too cute! I am loving the double plaid!! 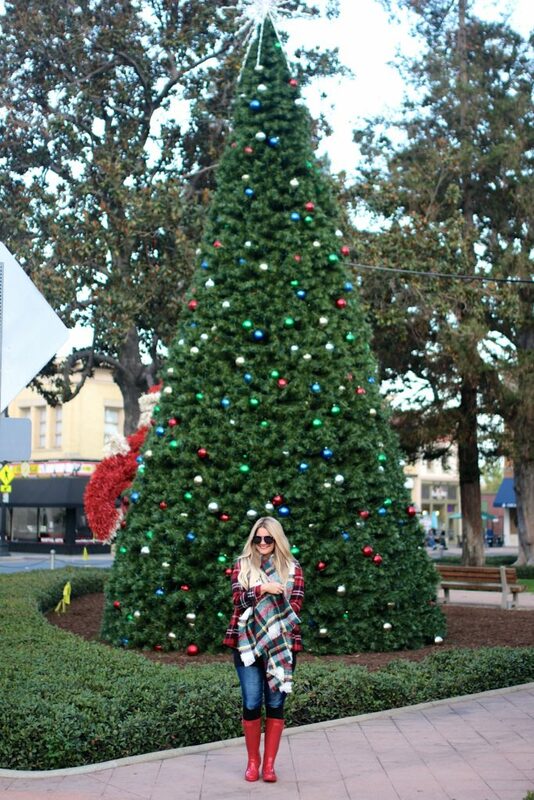 Look at that amazing tree- and you look so cute and festive, girl! Every year I dream of being finished before christmas, but usually I’m not done before little christmas, haha. You are just the cutest! You look amazing in all that plaid! So cute! Omg your photos are so cute. And I LOVE this giant tree!! Wish it fit in my house haha!